Canada made history one year ago, offering 25,000 Syrian refugees hope and peace in a new country. The first group of refugees landed in December 2015, with the remainder arriving over the following few months in cities across Canada. Among them was the Al Shanabani family, government-assisted refugees (GARS), who landed in Vancouver. 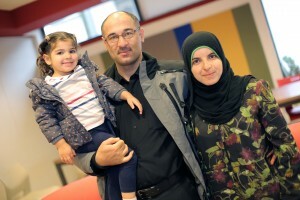 They quickly found a home, signed up for English language lessons and found daycare facilities for their two daughters. Lending them a helping hand in their journey has been another Syrian refugee — Mohammed Alsaleh. Alsaleh was among the first wave of 200 Syrians who came to Canada two years ago. Since last December, he has been employed as a settlement worker at ISSofBC Welcome Centre in Vancouver. When Alsaleh first welcomed Nedal and Taghreed Al Shanabani in his office, he showed them a chart with a curved line. You will experience four stages, he told them — a honeymoon period, culture shock, adjustment and adaption. He is also grateful to his Canadian landlords, Sheldon and Eileen, and says Sheldon is assisting him with driving lessons. When Al Shanabani lived in Syria, he was a farmer and a driver. “In time I would like to drive a truck or bus here,” he says. Taghreed says she will also search for employment once she is more fluent in English. “I would love to work with children,” she says. She wants to make sure her daughters, Rimas, 3, and Reetaj, 1, have educational opportunities. Originally from Daraa, Syria, the family endured President al-Assad’s military attacks when soldiers began employing tanks, ground artillery and fighter jets against civilians. They escaped to Jordan six months later, along with extended family members. “The [refugee] camps were horrible,” Nedal says. “We had some savings and were able to rent a house.” They registered with the United Nations Refugee Agency along with millions of other displaced Syrians. Unable to seek employment because of refugee status, the Al Shanabanis became dependent on others for financial assistance. Alsaleh understands his clients’ feeling of hope. He was in his fourth year of studies to become a doctor at a university in Homs, Syria, when his education was interrupted by the civil war. Then he got his own phone call from the United Nations with an offer to immigrate to Canada. On Nov. 25, 2014, he left Lebanon. “I entered the airport as a refugee, but walked out of the terminal in Vancouver as a permanent resident of Canada,” Alsaleh says. “The first conversation I had in English was at the Starbucks near the Welcome Centre.” He started working more on his English and looked into volunteering opportunities. He volunteered at the free clinic run by ISSofBC to assist people with income taxes. “I was helping greet clients, showing them around and making sure their income tax was done,” he says. 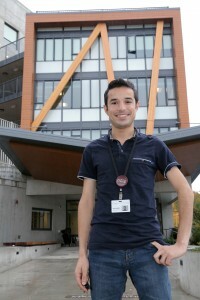 Alsaleh had only been in Canada for three months and it felt good to “give back” so soon. “By volunteering I was able to make friends, to build my own network, and overcome so many barriers, such as culture shock and loneliness,” he says. “We wanted to have an open free space for youth to come and connect with each other, share experiences and share the good things about their transition here to Canada,” he explains. He said he has only just paid back his own government loan for transportation to Canada and medical test costs. This debt is another concern voiced by participants. Alsaleh understands firsthand the emotional trauma refugees have experienced. The war has been going on for five years with no end in sight, a painful realization for Syrians now living in Canada. Looking forward, about 1,500 government-assisted refugees, including Syrians, are expected to arrive in B.C. by the end of this December, most settling in Metro Vancouver. The federal government is also in the process of accepting Yazidi refugees living in Iraq who have been targeted by ISIL militants. The Yazidis are a Kurdish-speaking religious minority who used to live mainly in northern Iraq.